The class represents the Intersection phase of the Boolean Operations algorithm. Splits the Pave Blocks of the given edges with the extra paves. The method also builds the shrunk data for the new pave blocks and in case there is no valid range on the pave block, the vertices of this pave block will be united making SD vertex. Parameter <theAddInterfs> defines whether this interference will be added into common table of interferences or not. The results of intersection are stored into the Data Structure of the algorithm. Gluing options - allows to speed up the calculation on the special cases, in which some sub-shapes are coincide. BOPAlgo_AlertBuildingPCurveFailed - in case building 2D curve for some of the edges on the faces has failed. BOPAlgo_AlertNullInputShapes - in case some of the arguments are null shapes. Adds the argument for operation. Adds the warning about failed intersection of pair of sub-shapes. 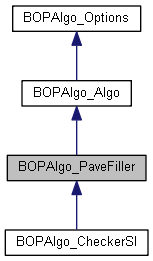 Analyzes the results of computation of the valid range for the pave block and in case of error adds the warning status, otherwise saves the valid range in the pave block. Checks if there are any common or intersecting sub shapes between two planar faces. Included in the same common block. The Faces of the same shape considered interfering in case they share the IN or SECTION edges. In case self-interference is found the warning is added. Clears all warnings and errors, and any data cached by the algorithm. User defined options are not cleared. Depending on the parameter aType it checks whether the vertex nV was created in EE or EF intersections. If so, it increases aTolVExt from tolerance value of vertex to the max distance from vertex nV to the ends of the range of common part. Possible values of aType: 1 - checks only EE; 2 - checks only EF; other - checks both types of intersections. The method looks for the additional common blocks among pairs of edges with the same bounding vertices. The method looks for the additional edge/face common blocks among pairs of edge/face having the same vertices. Performs intersection of given pave blocks with all faces from arguments. Updates tolerance of vertex with index <nV> to make it interfere with edge. Returns TRUE if intersection happened. Collects index nF and indices of all subshapes of the shape with index <nF> to the map <theMI>. Gets the bounding box for the given Pave Block. If Pave Block has shrunk data it will be used to get the box, and the Shrunk Range (<theSFirst>, <theSLast>). Otherwise the box will be computed using BndLib_Add3dCurve method, and the Shrunk Range will be equal to the PB's range. To avoid re-computation of the bounding box for the same Pave Block it will be saved in the map <thePBBox>. Returns FALSE in case the PB's range is less than the Precision::PConfusion(), otherwise returns TRUE. Collects indices of vertices created in all intersections between two faces (<nF1> and <nF2>) to the map <theMVStick>. Also, it collects indices of EF vertices to the <theMVEF> map and indices of all subshapes of these two faces to the <theMI> map. Performs the intersection of the vertices with edges. Returns the flag to avoid building of p-curves of edges on faces. Checks if the given pave block (created on section curve) coincides with any of the pave blocks of the faces created the section curve. Checks if the given pave block (created on section curve) coincides with any of the edges shared between the faces created the section curve. Performs intersection of new vertices, obtained in E/E and E/F intersections. Keeps data for post treatment. Adds the existing edges from the map <theMPBOnIn> which interfere with the vertices from <theMVB> map to the post treatment of section edges. Put paves on the curve <aBC> in case when <aBC> is closed 3D-curve. Checks and puts paves created in EF intersections on the curve <theNC>. Puts the pave nV on the curve theNC. Parameter aType defines whether to check the pave with extended tolerance: 0 - do not perform the check; other - perform the check (aType goes to ExtendedTolerance). Checks and puts paves from <theMVOnIn> on the curve <theNC>. At that, common (from theMVCommon) and not common vertices are processed differently. Treatment of the possible common zones, not detected by the Face/Face intersection algorithm, by intersection of each section edge with all faces not participated in creation of that section edge. If the intersection says that the section edge is lying on the face it will be added into FaceInfo structure of the face as IN edge and will be used for splitting. Reduce the intersection range using the common ranges of Edge/Edge interferences to avoid creation of close intersection vertices. Check all edges on the micro status and remove the positive ones. When all section edges are created and no increase of the tolerance of vertices put on the section edges is expected, make sure that the created sections have valid range. If any of the section edges do not have valid range, remove them from Face/Face intersection info and from the input <theMSCPB> map. Put such edges into <MicroPB> map for further unification of their vertices in the PostTreatFF method. All these section edges have already been checked to have valid range. Current check is necessary for the edges whose vertices have also been put on other section edges with greater tolerance, which has caused increase of the tolerance value of the vertices. Removes indices of vertices that are already on the curve <theNC> from the map <theMV>. It is used in PutEFPavesOnCurve and PutStickPavesOnCurve methods. Repeat intersection of sub-shapes with increased vertices. Sets the arguments for operation. Sets the flag to avoid building of p-curves of edges on faces. Sets the flag that defines the mode of treatment. In non-destructive mode the argument shapes are not modified. Instead a copy of a sub-shape is created in the result if it is needed to be updated. Sets non-destructive mode automatically if an argument contains a locked sub-shape (see TopoDS_Shape::Locked()). Creates new edge from the edge nE with vertices nV1 and nV2 and returns the index of that new edge in the DS. If some of the Pave Blocks are forming the Common Blocks, the splits of the Pave Blocks will also form a Common Block. Treatment of vertices that were created in EE intersections. Replaces existing pave block <thePB> with new pave blocks <theLPB>. The list <theLPB> contains images of <thePB> which were created in the post treatment of section edges. Tries to project the new edges on the faces contained in the <thePBFacesMap>. Updates the information about faces. Updates pave blocks which have the paves with indices contained in the map <aDMNewSD>. Updates tolerance vertex nV due to V/E interference. It always creates new vertex if nV is from arguments. DS index of updated vertex. Updates vertices of CommonBlocks with real tolerance of CB. Fence map of intersected faces and pave blocks. Sub-shapes with increased tolerance during the operation. Vertices located close to E/E or E/F intersection points which has already been extended to cover the real intersection points, and should not be extended any longer to be put on a section curve.